Arizona Broadway Theatre enriches lives through the power of the performing arts by producing live theatre and other high-quality entertainment. 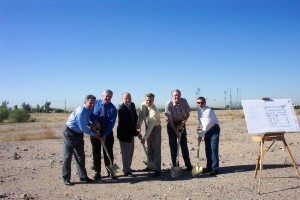 Arizona Broadway Theatre will be at the heart of a culturally rich community. The vision and goal of Arizona Broadway Theatre has always been to offer a total entertainment experience – a one-of-a-kind venue combining quality dining and professional theatre – at a great value. However, as the axiom goes, nothing worthwhile comes easy. When construction began in late fall 2004, ABT’s founders – Kiel, Cassandra, Ronald and Penelope Klaphake – expected the theatre to be completed by September 2005. Construction delays, however, caused a slight detour on the theatre’s way to settling in at 7701 W. Paradise Lane. We forged ahead and opened our first show, Anything Goes, in a large pavilion (okay…tent) at the Peoria Sports Complex. Our patrons experienced food prepared in a dugout kitchen, an array of daytime and nighttime temperatures, baseballs landing on the roof, and street sounds at the most inopportune times. (Not to mention one heck of a show!) But, our customers endured (as did our employees) and we finally opened our new facility on January 3, 2006. Despite the obstacles and delays, ABT announced an ambitious second season to the delight of its knowledgeable and loyal patrons, and, during the summer of 2006, kicked off its Academy for Young Performers aiming to enrich the lives of children through the performing arts. Season Two opened – on time, and rather ironically – with How to Succeed in Business Without Really Trying. The Encore Room, a multi-purpose banquet space located off the lobby, was unveiled in November 2006 for holiday parties and special events. ABT initiated its Toys For Tots campaign at its Christmas Tree Lighting and presented a spectacular New Year’s Eve Gala to a sold-out audience.Father time marched on, curtains were raised and lowered, and even greater numbers of audience members responded by becoming season subscribers, recognizing ABT’s commitment to excellence. The all-time favorite Grease enjoyed an extended-run to sell-out crowds, and Pump Boys & Dinettes gracefully closed out our second season, which welcomed 97,000 customers. The ariZoni Theatre Awards of Excellence announced its nominations, and ABT garnered 24 nominations, a significant feat in its first year of eligibility, and went on to win in seven of 13 categories. Little Shop of Horrors opened Season Three, showing off some of ABT’s advanced stage capabilities by incorporating a trap door and a multi-level set. The holidays were abuzz with activity: tap shoes were flying with Crazy for You; ABT performers shown brightly among the 1.5 million lights of Glendale Glitters; Peoria Unified School District students entertained guests in the lavishly decorated lobby; the Encore Room took on an added dimension by becoming a venue for Mystery Dinner Theatre and a special Holiday Cabaret. As 2008 approached, ABT created a new not-for-profit organization – the ABT Performing Arts Association, Inc. – and on January 1, 2008, the founders literally and seamlessly turned the keys to the theatrical operation over to the new entity. With a Board of Trustees in place, the Association is now responsible for the day-to-day activities of the theatre. This approach allows ABT to apply for grants from foundations and governmental sources, to lower its operating costs and to attract sponsorship and advertising dollars. Productions of the hit show Fiddler on the Roof, followed by Jekyll & Hyde, Ain’t Misbehavin’, The Music Man and Nunsense rounded out our third season, and ABT presented its milestone 1,000th performance. Now in its second decade, ABT continues to strive to be a different kind of dinner theatre, presenting you – our loyal patrons – with a venue unique to the Valley. May the curtain continue to rise.